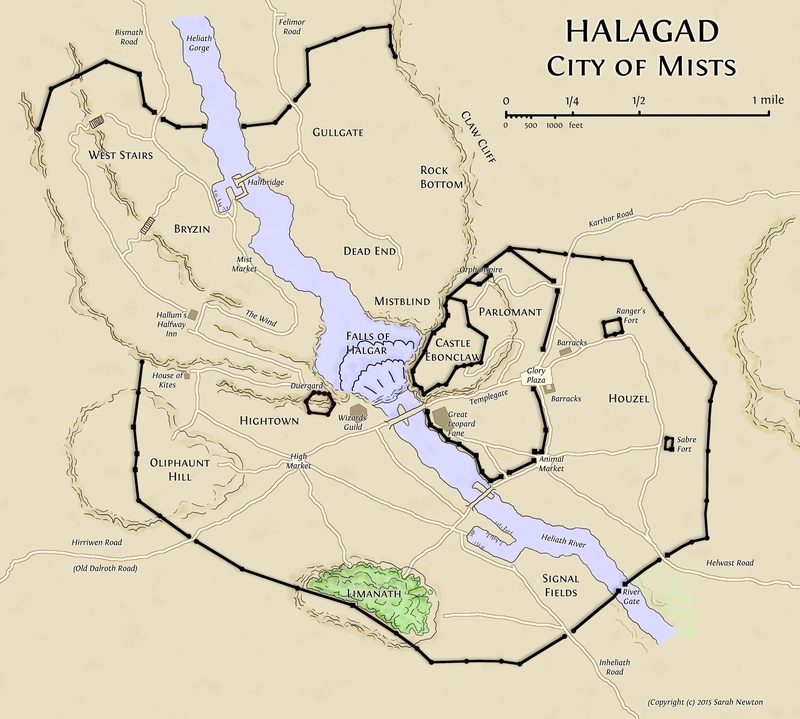 World-building: The Gates of Halagad Are Open! So another week has passed on the Mindjammer Kickstarter for my far future transhuman science-fiction RPG – check it out to see the massive expansion of the Mindjammer universe our awesome backers have enabled us to achieve, and maybe pledge yourself if you’re looking for an action-packed, modern, 21st century style far future SF RPG, or you just want to help fund Mindjammer Press and my RPG writing efforts (like this blog!). Obviously again this is a work-in-progress – in fact it’s my very first rough map of the city. But I hope you’ll think too that it’s got the makings of a great city for adventuring. First, note that whacking great waterfall right in the heart of the city. The Falls of Halgar bisect Halagad, with the “old city” around the castle, Parlomant, and Templegate, together with Oliphaunt Hill, Houzel, and elven Limanath being above the falls, and Bryzin and the West Stairs (with their hobb holes), Dead-end and Gullgate being below the cliffs in the gorge of the Heliath river, below the falls. Right on the divide, running alongside the falls, is “the Wind”, a winding street used by porters and traders moving cargoes from the docks above and below the falls, transporting goods to and from the elven lands of Inheliath in the south, and up the gorge past Bismath and Felimor and out into the Lake of Mists and to the Salaman heartland and the great Darshi river far to the north. Next up on the city map: well, all of the detail, really. Currently it’s just bare bones, and needs colour and much more content. First, I have some thinking to do about the walls: fortification of the “new city” began in earnest 50 years ago, and I’m not sure yet how far it’s got, and whether I need to have walls above the clifftops of the Heliath gorge. Possibly. Also, I’ve only drawn in the main thoroughfares and just a handful of buildings I knew to place. There are hundreds of smaller streets and alleyways – I think the population of Halagad is at least 50,000, and possibly as many as 150,000, and their abodes and lanes and weinds will doubtless shortly start to emerge. I think I have the scale correct for a city of that population – but again it’s possible I have it a little bit on the large side right now. Hopefully a lot of this will get sorted out in the next draft. But right now that pretty much marks my “first pass” of the Ximuria campaign maps done. I have Blackfear Dungeon, the Giantwitch Woods, Angistoth and Trollbridge all mapped in rough; also Ximuria, the Wilderness of Toth, and now Halagad. The next step is to live with these for a bit, print out some copies and get scribbling all over them, and of course to expand my 20K-word rough manuscript into a fuller draft. I think we might be about to start playing my first game of Tunnels and Trolls in many years! The Ximuria setting (including the city of Halagad) is (c) copyright 2015 Sarah Newton. All rights reserved. Deluxe Tunnels and Trolls is (c) copyright 2015 Ken St Andre, Liz Danforth, Rick Loomis, Steven Crompton, and Jim Peters. It’s also available now from www.deluxetunnelsandtrolls.com. Wow, Ximuria and Toth and Halagad are quite the impressive pile of world-building. I certainly look forward to your descriptions of the NPCs and the PCs when you get a chance to both start play and report back to us. Your rough sketch looks better than most finished products I’ve seen. This definitely looks more like a city where adventure is happening much more than a “quiet” place to base ones adventures out of. I can imagine characters, bloodied and bruised, returning to town only to find out things haven’t stood still and they face as much trouble as they did out in the wild. Thanks Paul! You’re absolutely right – I wanted a city in the spirit of the City of Terrors, or perhaps the City State of the Invincible Overlord or Viridistan. Somewhere where there’s *lots* going on. Certainly somewhere where you can hole up and make a base – but equally somewhere which is a place of adventure, where once you establish yourself you become a target for factions good and bad, and get inveigled in the deadly machinations of a city in ferment.